From the cellar: The wine literati rarely return to the scene of their crimes, er, predictions. Perhaps every wine they claim has legs to stay the course should be put in the vault to test the assumption. This expensive vintage certainly didn’t merit the wait. The “from the cellar” category on this blog is an attempt to reconcile recommended drinking with recommended wines. It’s taking years. 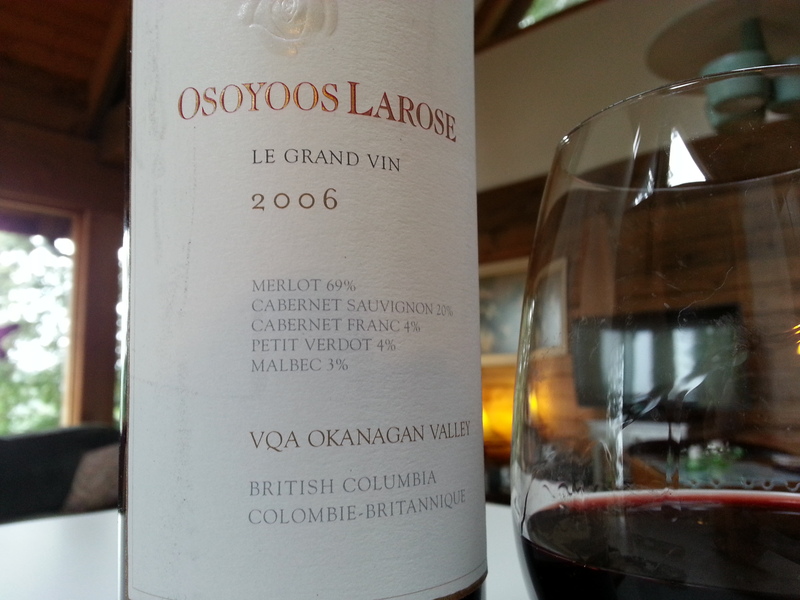 With a release review that it could last well into the mid teens, the 06 Larose was a tepid competitor to less costly reds with finer grace and more complexity that we’re corking (or unscrewing) from in and around the same vintage. Again and again, Spain, the “New World” (i.e., Chile and Argentina) and (with shocking consistency) Washington reds, are trumping the “cellar keeps” we’ve been documenting, opening as per the “advocates” and comparing against original reviews. Time did not tame the beast. In truth, it drank decent. It drank OK. It drank like a C+, a good red, but lacked even the elemental surprise of what the (often dismal) 05 Bordeaux’s came out into the decanter seven years later. Liquorice, tobacco, dark fruit, a burnt-Christmas pudding piquant-ish after taste, a whopping 69% Merlot but not a whiff of vanilla left. To call this wine a keeper is to akin to giving Kissinger the Nobel Peace Prize: He goes down in history as a laureate, but was there no one else in the running more worthy? NB: Kermit Lynch, one of my wine gurus, had a fitting interview in the New York Times on October 20, 2013 which spelled out all my discontent with this bottle and in fact (although a little cranky) speaks for millions of wine lovers/wine drinkers on price, alcohol content and the overbearing point system. Essentially, he says it best. Read it yourself. Price: A ridiculous $45 in 2008 with a review to keep, keep, keep. Market Liquidity: Remember when Borg tried a comeback with a wooden racquet? ‘Nuff said. Too much money for not enough wine but wonderful wine nonetheless. That’s not what you read in wine reviews because reviewers don’t pay after tax dollars for wine but as much as we liked this white—particularly its steely Chablis-ishness and its near-addictive mineral finish—we just couldn’t stomach the $24 USD (which converts to Canadian at $30). I think it could drink well with Chinese. I mean that as a compliment. Would wash down any Asian food a tad on the greasy side. But it could saddle up nice to salmon or artisanal cheese as you would expect. If you were thinking Sauv Blanc you could pass this off instead. 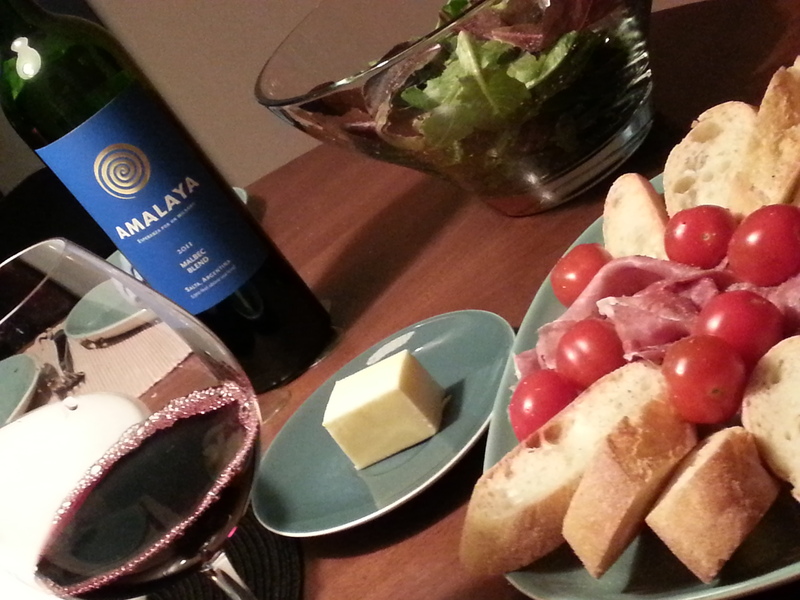 As an aperitif, it was lovely. It has much more flexibility than the regular run of the mill and dominant chards of your everyday California sort, isn’t cloying or drowned in oak-fiber or overflowing in that faux garden potpourri we’ve witnessed in plonk at parties. But it lacks the refinement and even excitement of, say, the Grgich Hill we had last week and leans toward an acid tang, not the butterscotch lushness of a cru Burgundy. Market Liquidity: When second best will do. Superb in more ways than wine descriptors allow. Not tame, too sweet or chalky. Immensely likeable. Licorice, pepper on the palate with a cool and lingering cherry vanilla finish. A magnificent mouthful. Decanted a dream. Up in BC we like to revel in how far our wine industry has come (from Andres screw tops to Osoyoos LaRose) and how mature and diverse the viniculture is. It’s true. Long way baby, Virginia Slims long way. Bang a drum. Sing the anthem. But here in the land of reality (i.e., after-tax income), as we slowly sample bottle after bottle of brilliant Washington State wine, at a fraction of the CDN price, it makes a mockery of the provincial hoopla. Market Liquidity: Source it if you can. 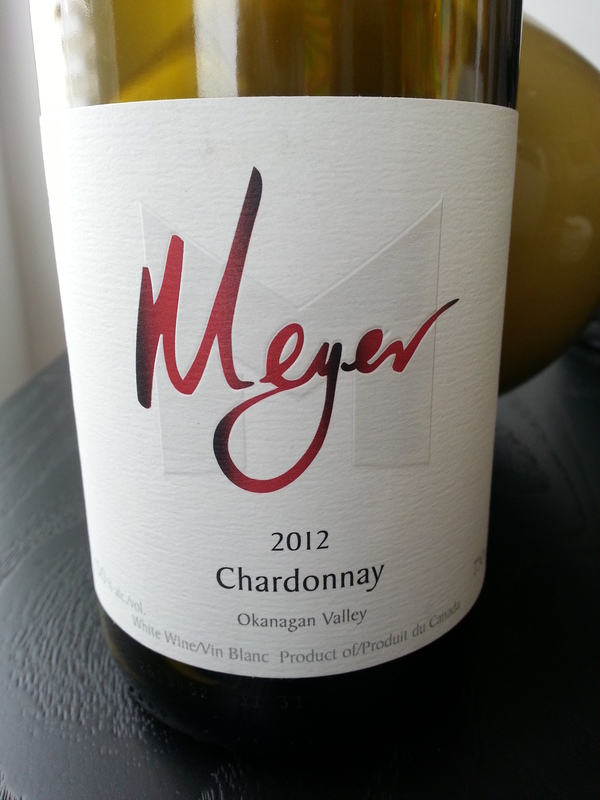 Meyer makes a host of upper-echelon bottles and then a second tier of affordable wines. This falls into the latter. But it’s lovely all the same. Fresh, refreshing, flinty, non-oaked, lively and versatile. The bottle claims it will improve to 2016. Shurly shome mishtake? 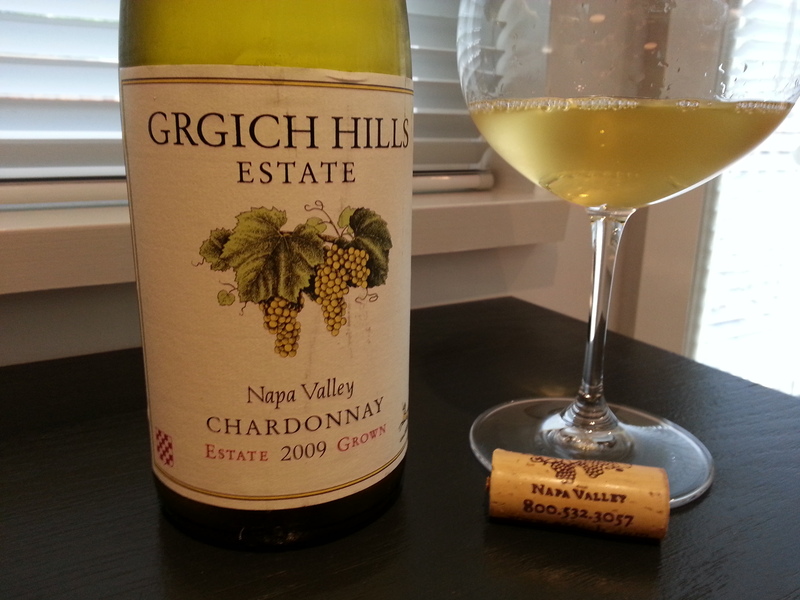 This lacks a deep nose (or, put another way, has scant bouquet in the glass) and tends toward the generic in chardonnays but if you could find it (and you probably can’t, that’s the way with BC wines) it would be a wonderful weekday standby at the price. Market Liquidity: A house wine for the house. Exactly what we are on the hunt for: Hugely satisfying reds under $20. While mostly Malbec, this gorgeous blend, if a little simple, is an Argentinian red from the up and coming Salta region (or at least, in BC, up and becoming available). Paired perfect with meat (pork) as well as cheese and eggs. Soft on the palate, none of the stinging tannins that often come with Malbec. As usual, we love blends, we love change in our pocket, and South America comes through with a lush, soft red, lingering tobacco, anise and moderate fruit. Goes chocolate and cinnamon by the dregs. Kudos for a) being readily available across the province and b) 14% alcohol when most of its kin are 14.5% and higher and c) priced below less palatable BC reds. Price: $19.99 at BC Liquor. Market Liquidity: Easy to like, easier to drink. From the cellar: (But, truthfully, it didn’t last long in the cellar. I simply couldn’t resist.) This wine has never disappointed me. It’s pricy, I only ever buy it marked down (so rarely, and only on jaunts south of the border), the connoisseurs tend to give it short shrift (I feel, like 90 points when it hits 92), but it drinks beautifully. A lovely golden hue, Vouvray-ish, none of the cloying crassness of lesser California chards, dry but not sere, not too much of the metallic crispness that defines the uber-echelons (e.g., Montelena), and just enough fruit to make it both a satisfying sipper and food friendly. Restrained oak that is a master class in barrel aging wines. 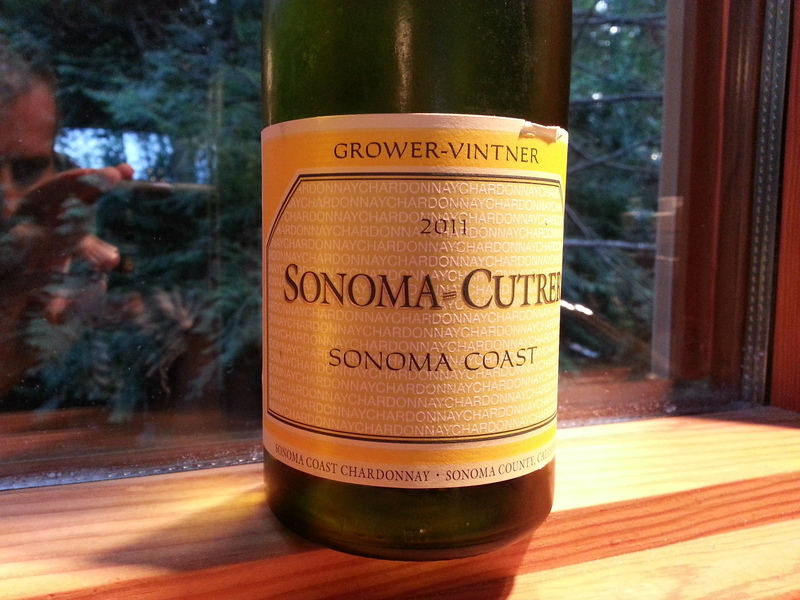 A few minutes out of the fridge brings out a gorgeous bouquet like a fruit orchard with a creamy top note. Market Liquidity: Like a freshly laundered starched white shirt. Impeccable. 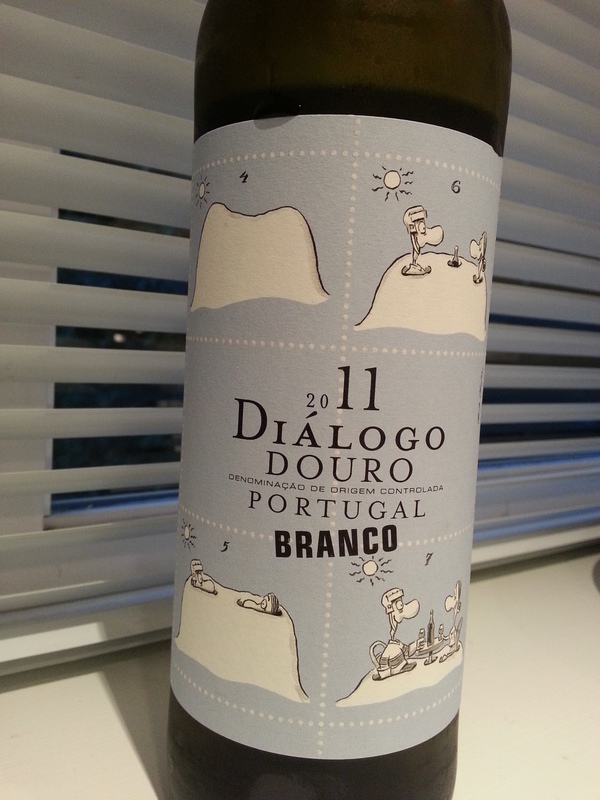 Kudos to BC Liquor for buying quirky, interesting and novel whites that will never be high pointers or regular standbys. This has an aromatic light perfume, blossoms and sub-acid fruit notes, an inch of cloying-ness, a not too subtle richness, and a sweetness that doesn’t linger too long. A quirky and quixotic blend that would be a good foil for any experts in your clique. 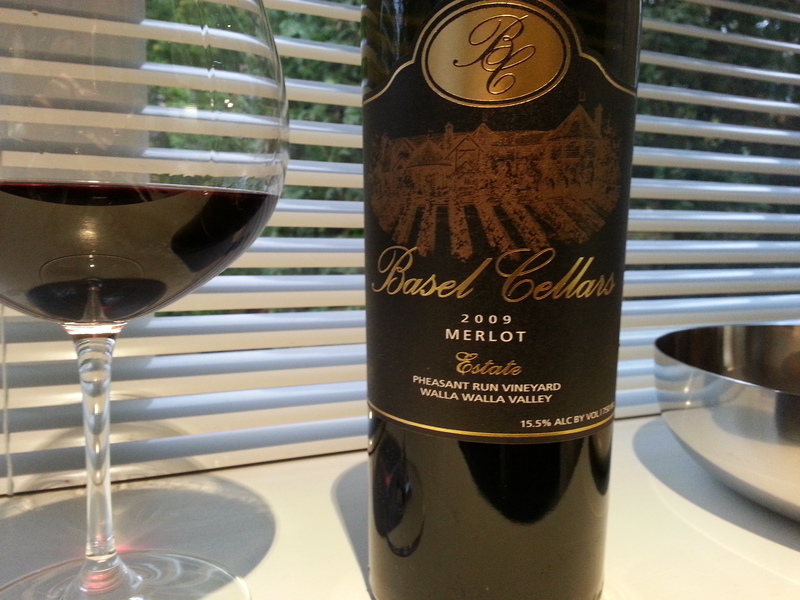 We sipped it with a Pissaladière (basically a strong cheese quiche) and it paired beautifully. A little too much weight on its own, unless you are under an umbrella eating clams in the Costa do Sol. If you like the adventure of wine, of discovering new varietals, or maybe just have an endless curiosity about viniculture, there are worse ways to blow 20 bucks. Christ, we’d never even heard of the grapes that coalesced to produce this lovely vintage. But just in terms of reviewing and liking and buying again, just in terms of sharing wine with friends and having a laugh, we found the Boutari a little more social (this is sort of Harold Lloyd, Boutari more Marx Bros). Price: $19.99 at government stores.